i guess i'm just not loving any outfits i have right now. so i'm going to post about food instead. since i am a sugar addict trying to recover, i need to keep things around my house that will satisfy my sweet tooth while still keeping me on the paleo track. i've tried several different dessert recipes, some have passed and some have failed miserably. it's just not easy making healthy comfort food! here is one recipe that passed the test. the "cobbler crust" is from this apple crisp recipe and i switched up the fruit from apples to pears and berries. 1. in a large bowl combine almond flour, salt, cinnamon, and cloves. 2. in another bowl combine oil, nectar, and vanilla. 3. add wet ingredients to dry ingredients. the mixture will turn a little pasty. 4. toss pears, berries, and coconut palm sugar. 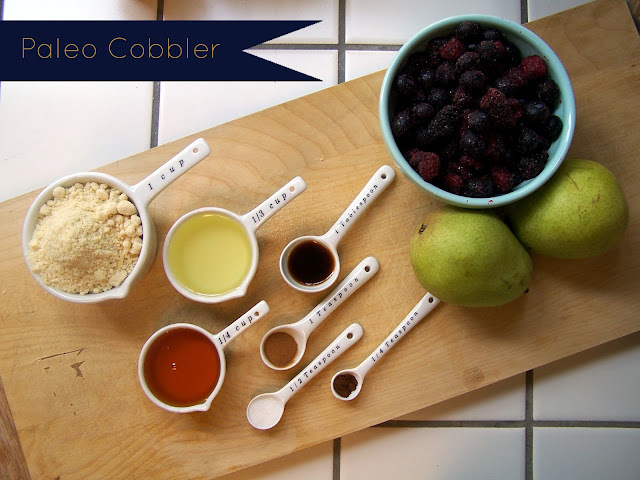 6. grab chunks of the cobbler paste and crumble over pear berry mixture. i had a sweet new friend over earlier this morning to test it out and we both loved it! i hope you do to.